I have a MacBook that has automatically connected to Xfinity hotspots ever since I logged into a friends apartment wifi years ago. They now live outside the US, so I doubt they still have an account. How is the information that allows me to automatically connect stored? I was looking in the keychain access app and could not find any stored passwords / keys. For my other computers Xfinity will throw a popup asking me for account information. I was hoping I could figure out how to copy the password / validation key information to other computers I own for wifi access on the go. Perhaps it is handled differently, but either way it seemed an interesting question to learn the answer to. Thanks! That information is in your keychain. Just enter the name of the WiFi in the search box in key chain. If you do not know the name look it up. All the networks that your computer has ever joined are saved in System Preference > Networks > advanced. UPDATE.....Xfinity WiFi is not actually called Xfintiy, it is called Comcast. Use Comcast when searching in your keychain. I just looked up mine and there it is, even so I do no longer use it. and welcome! Like Buscar says, the information is in your keychain. Here’s how you find it - go to the keychain manager (my favorite route is Spotlight via CMD-Spacebar, but you could go through the Utilities folder too). In there you can very quickly search for the network - type “xfinity” - if it’s the same as what I’m familiar with, it will be all lowercase like that. Once you find the entry for the network, you can unlock the entry and view the password. Probably the password to unlock it will be the same one you use to log on to your computer’s user account. Incidentally - in my experience, you can’t connect to an xfinity hotspot without valid customer account credentials. You might lose access soon... but who knows. It’s also possible that even with this info, another machine would have to provide the customer account info, which you don’t have access to. I hope it all works though. FWIW, you can stop it from automatically connecting to the hotspots if you like. Just go to your network settings, highlight and open up the settings for the xfinity network, and turn off “automatically connect to this network.” You won’t lose your login info, you just gain more control over when you’re connectd. Not the answer you're looking for? Browse other questions tagged wifi keychain login . 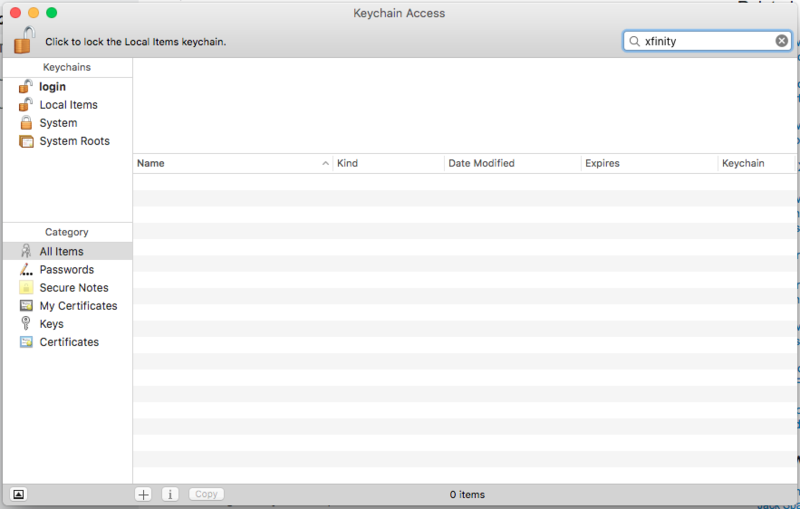 How does iCloud Keychain store unsecured wifi hotspot information? How do I connect my Mac to wifi automatically? How to make MacBook automatically connect to different wifi networks as desired? Connect automatically to VPN when connecting to wifi access point?